Trinity is focused on educating and guiding the next generation of skilled, dedicated physicians. As we've made abundantly clear, we consider your experience, background, and passions beyond academia a crucial component of this, which is why we put so much emphasis on the interview (speaking frankly, having our committees evaluate a candidate's grades and test scores in the context of their experiences and overall character gives us a much more robust framework to evaluate them for acceptance). As a result, we meet driven students who are going to make remarkable doctors if they're given the best opportunity available to them. To address this, we offer the Individualized Learning Plan (ILP). The ILP is a systemic adaptation to our students' transition to medical school in general and life on St. Vincent. Essentially, we split up the traditional first term academic load across two terms, and only then move students onto the traditional track. While it seems straightforward, on the back end, the process comes from the outcomes-based prep you see in top performers in a competency based evaluation track (an idea Trinity has emphasized for quite some time, but is only now becoming the major paradigm in medical education). While the ILP is open to any student that thinks they will benefit from this approach, it is particularly impactful for non-traditional students eager to change careers or return to school after some time off, but hesitant about adapting to the intensity of adjusting to a full load of classes in medical school. Other major benefactors are the ambitious, bright students that, for whatever reason, simply did not perform as well as they'd hoped on their MCAT and have found themselves shut out of other schools despite their overall potential. As we've said, the MCAT exam is not a predictor of your future as a physician (that's what the USMLE Step exams are for). 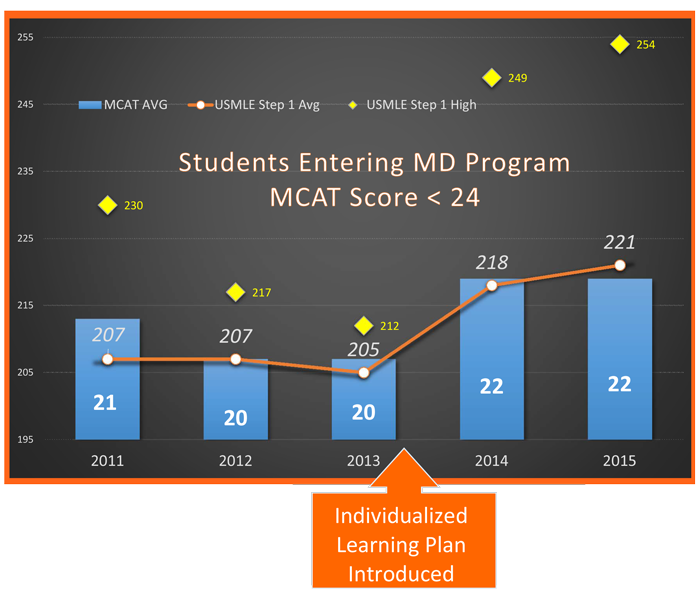 The chart below demonstrates that our students with a lower than the US-average MCAT score, a 25 for the past several years, were able to achieve significant success on the Step Exams. In the right surroundings, with the support of the faculty, and a will to succeed, we've proven that a student scoring a 24 on the MCAT can earn a 254 on Step 1. It's what you do in medical school that will shape your future. Trinity is more than a medical school. It's an experience in academic best practices research. The vetted, tested curriculum is always adjusted to make sure students get the most out of their education and flourishing like they've always known they could in the right environment, while still maintaining a quality life and preserving that character, that personality that made us first think, "Yes, this person needs to be out there helping others as a physician." If it sounds like we're bragging, it's because we are (a little). It's because our approach works and we're very proud of our students and graduates. If you'd like to learn more about the ILP program, click here (or on the photo to the right) to read up, watch a short video, or listen to a webinar. You can also, as always, contact us directly. We look forward to hearing from you.